Strawberry strombus shells are cut in such a way to reveal the inside of the sea shell. 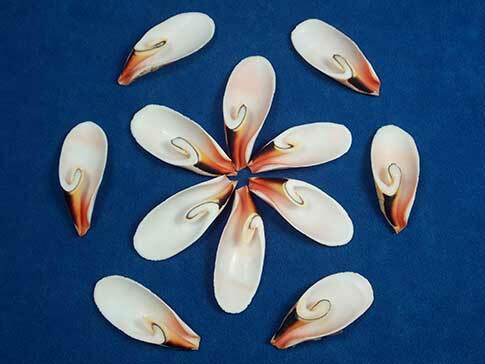 This lily cut accents the natural beauty and makes the shell resemble a flower. You will need 12 shells to make the arangement shown in the picture. Each cut shell sold separately. The picture does not reveal the pink hue that mixes with the white interior. Craftsmen often turn these gems into necklaces, earrings, or sailor's valelntines. The possiblities are endless.